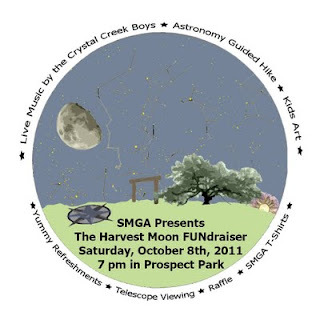 On Saturday, October 8th, 2011, the San Marcos Greenbelt Alliance will be hosting a Harvest Moon FUNdraiser! Starting at sundown (7 pm) under the Learning Tree in Purgatory Creek Natural Area-Prospect Park, we will have food and activities for your enjoyment. Participate in an astronomy hike guided by Texas State astronomy professor Russell L Doescher starting at 7:30PM. Or just hang out at the Learning Tree and enjoy sodas, chips, baked goods and sausage wraps for sale while they last. Four days away from full, the moon will cast light on a live performance by the Crystal Creek Boys starting at 8:30PM. You will be able to look through a telescope to view planetary bodies up close, enter a raffle to win prizes, and take home a new SMGA T-shirt! Bring the kids, and they can participate in an art project. This event raises funds to benefit the good work of the San Marcos Greenbelt Alliance. Our mission is to create and conserve an interconnected system of parks and natural areas for our community and future generations. SMGA is an all-volunteer, non-profit organization that works to preserve greenspace in our growing city and make it accessible to the city’s residents. Come out and support our many projects, including trail building and maintenance, installing trail signage and kiosk displays, invasive plant removal, and conservation advocacy, to name just a few! Rain date will be in early November, date to be announced. • Your pup might be happier at home, but if you bring her along, remember that leashes are required in city parks. Also please bring bags and use your flashlight to pick up her waste. Directions: From downtown San Marcos, take W Hopkins St. to N Bishop St. Turn west (uphill) on Bishop and left on Prospect St. Go 2.5 blocks to dead end. Park on the street near the kiosk. Parking is limited, so consider carpooling, walking, or biking; a bike rack is available. Follow the lighted trail that winds through the cedar break, and then emerges into the field. From there you will find the fun under the Learning Tree and by the large compass.